A Computer That Writes Programs For You. What will they think of next..? Your computer is fantastically fast...once it knows what to do. You probably realize that a computer is really the combination of hardware and software, working together smoothly, to give you what you want. Either one alone is useless. Software is really the key...the "mind" of a computer system. Every project or task you want to do requires a new specific software application to make it behave exactly the way you desire. Of course, you may be able to "force-fit" an application into some existing canned program you have, but to really get results, you need a separate application program to run on your computer. Until now, that meant you were forced to pay money for application software off the shelf, or if you could afford it, have it custom written for you, or, if you are qualified, do it yourself...spending endless hours figuring it out and writing it. Now, your computer can write individual application programs for you. These programs are each separate, unique software programs that run in standard Basic on your computer. A company named FutureSoft has developed this exciting and long awaited remarkable working tool for you. There are two versions called Quikpro+Plus and standard Quikpro. Both of them create unique separate Basic programs for you...to do exactly, precisely, what you want to do. And listen to this...you create a new program in minutes instead of hours. You can quickly generate a new program when you want it. You can generate thousands of different unique programs, each one standing alone as a complete program that runs in Basic. Best of all, you do not have to be a programmer to do it. 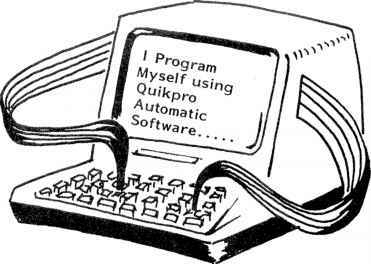 The Quikpro software becomes your personal programmer, waiting to do your work for you any time of day or night you choose to use it. The custom programs you generate from this software provide for: Data Entry, Additions, Changes, Record Locating & Searches, great variety of Computations, and Report Printing (if you have a printer). It lets you decide what data to manipulate and how to manipulate it. It lets you decide the formats you want to appear on your screen and/or to print out in a report. It lets you use differing formats on the same data base. It lets'you make calculations from data within records without altering the data base. It lets you report results with or without including the base data from which results were calculated. error free instructional sequences. You get the immediate benefits of professionally written software for your application. The resulting custom program is truly a separate Basic program. You can list it, you can modify it, you can actually see what makes it tick. You can even ask it to print out its own operating instruction manual so others can run it for you. Finally, you can really tap the speed and power of your computer the way you really want. You can create new programs for every use you have in Business, Science, Education, and Hobby areas. And you can start now. The software is available immediately from the creators. It comes in two versions. If you want to generate separate Basic programs with all the data handling plus Calculations and Report Printing features, you want Quikpro+Plus. Specify to run on TRS80 Model I and Model III at only $149; to run on TRS80 Model II at $189. If you do not need Calculation ability or Report Printing in the separate Basic programs you will create from this program generating software, then standard Quikpro will do the job for you. Standard Quikpro to run on TRS80 Model I or Model III is $89; to run on TRS80 Model II is $129. (Later on you can always trade up to the Plus Versions for only the cost difference between the two). Both programs are available to run on many other computers besides TRS80. Details are available by calling or writing. Operators on duty 24 hours daily. Operators can not answer technical questions. If you need technical information or want to order from Canada or other nations, call 1-904-269-1918 during office hours, Eastern Time, Mon.-Fri.
"Cost-conscious software purchasers will appreciate KTI's generic software." Cost-conscious software purchasers will appreciate Kitchen Table Inc.'s generic software. These programs—packaged in plain white disk envelopes and unlabeled cassettes—eschew costly extras like documentation, menus, error traps and debugging. Generic Game is a graphics encounter with aliens and space ships. As near as I can determine, the object is to shoot the space ships or capture the alien's king before losing all your pawns. Game counts on the honor system for scoring and because its rules are generated through a RND routine, each game is a little different. Generic Utility performs many useful functions, but I am not able to determine what they are. However, in benchmark testing, it operated faster than similar programs. The software will accept any command you can think of and respond by starting up yourdisk drives, flashing hexadecimal numbers on the screen, and changing the setting of your RS-232 board. Some commands cause the keyboard to become warm to the touch, while others increase the CRT's brightness tenfold. While I'm not certain why this is desirable, I was impressed with the utility's complexity. Input for the Generic Business Program may include invoice numbers, quantity shipped, check numbers, amount paid, employee time card information, inven tory data, and airline schedules. The information is sorted, compiled, alphabetized, and processed, then dumped onto random-access disk files that can't be retrieved. Although the program issues no useful reports, KTI maintains no company using the software has ever been successfully audited. Generic Realtime Operating System Software is DROSSDOS stripped of its good parts. No utility programs are provided with GROSSDOS and a user must furnish his own Disk Basic. File handling, directories, copying, formatting and cursor display are not supported. Only one module is supplied: BOOT/SYS. It allows the user to boot-up the GROSSDOS banner. This simple operating system is well suited to the newcomer who gets confused when the ready prompt asks for input and he can't think of what to do next. 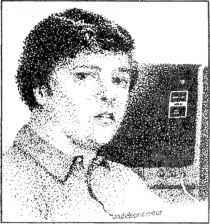 Generic Bulletin Board is possibly the world's first manually operated BBS. 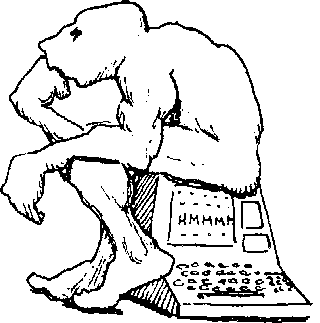 The sysop must sit at a computer at all times to answer the phone, transmit the menu and other choices to callers, and enter messages into the system. This makes for a remarkably friendly bulletin board. I called recently and to my read-messages command, I got: JUST A MINUTE WHILE I FINISH THIS SANDWICH. The program enables users without an auto answer modem, host terminal program, and other expensive extras to operate a bulletin board system. — Hello. This is my first time on the hotline. —Could you be more specific? —Well, my computer seems to be losing data frequently. — Do computers trouble you? —We were discussing you, not me. —No, I just wanted to see if I had a RAM problem. —Are you saying no just to be negative? —I never dreamed that you would be such little help. —What does that dream suggest to you? — Did you come to me because you are disgusted? I suspect I called during the technician's lunch hour or chatted with a file clerk or other unqualified person. Questions continue to pour in about KTI's fictitious products. As a result, I've been forced to devote some valuable space to answering them. Q. I've been using KTI's 7.5 gigabyte hard disk drive for six months. I find it takes two hours to read the directory. What can I do? A. Hold on! Kitchen Table is introducing the first-ever "Menu Oriented" directory making it no longer necessary to read the entire KTI-7500 directory, which averages 127 pages. Q. Double density does not provide adequate storage for me and I cannot afford a KTI-7500. Suggestions? A. Yes. Users of DOUBLOON II can remove the 1791 chip and insert a second double density converter in its place. The result: quadruple density! You may also purchase KTI's quadruple density board, the QUADROON. Q. What is the largest single data file that has ever been compiled? A. Using the KTI-7500,1 have squeezed a listing of all my creditors on a single hard disk drive. The second largest file consists of the text of all Wayne Green's editorials. Q. Why is a 4-bit microprocessor used in the KTI Pockets Computer? A. Because it costs 50 cents, a 50 percent savings over a 6-bit microprocessor. Q. I wish to backup my KTI-7500 data files. I don't own a video recorder but my neighbor does. Can you tell me how to do this? A. The correct command is ROUTE Hard Disk to Neighbor's VCR. You don't have to connect the two devices. Set the switch on the top of the KTI-7500 to channel 2 or 3 (whichever is not used in your area) and orient your neighbor's antenna toward your computer. Q. I am a reviewer for a competing computer magazine. Could you put me on your mailing list to receive your new releases? I would also like complimentary review copies of all your software. Although my reviews would be unbiased, I would appreciate a monthly complimentary check for $200 to partially subsidize the extensive testing that I do. I also believe I would do a much better job than that jerk who writes those columns for 80 Micro. A. Kitchen Table deeply appreciates your interest and would like to return the favor by pointing out a small error you may have not noticed. You have supplied different social security numbers to several magazines you did work for in 1981. Don't bother to fix this oversight. We have forwarded your name to the only government agency which can be counted on to get things done—the IRS. Your cassette based TRS-80* can handle data files! RAMFILE is the answer. It will allow you to write BASIC programs that will efficiently store data in the Random Access Memory of your computer. You will be able to sort and selectively retrieve, update and delete the data and store it on tape for future use, at a speed and efficiency that you never thought possible. RAMFILE runs with 16K or larger Level II or Model III BASIC. RAMFILE and demonstration BASIC program on cassette tape and manual. $59.95. Postage paid in U.S.A. Foreign orders include $2.50. 111. Residents include 5% sales tax.